What did you like best about Holiday for the Hostile? What did you like least? It is creative but it is in its own book universe........ it moves from one genre to another I am not sure what category it is.The Author needs to know before the reader has any chance of understanding the true intent of the story. Would you be willing to try another book from Joy Mutter? Why or why not? Yes because I believe he has talent but needs to be more focused on the genre of the book he is writing. What does Alexander Doddy bring to the story that you wouldn’t experience if you just read the book? He brings depth to the characters and makes the story more entertaining. Could you see Holiday for the Hostile being made into a movie or a TV series? Who should the stars be? The work needs more focus before it can go into production. "Holiday for the Hostile" was my favorite of this three part series. This story dealt not only in the paranormal with Tile X (as in the first book) but also dabbled in the horrors committed by man. More of a cross between a paranormal horror and a murder mystery, this tale was enjoyable on multiple levels. The narration was leaps and bounds better than the first story in the series, but like the first story, this one sort of just drops off at the end. When I read a book, I appreciate the courtesy of an actual ending! I wouldn't recommend reading this book unless you've already read book one and intend on reading book three! I was happy to find that the first portion of the book catches you up on what you missed if you didn't read/listen to book one. I think I might have been annoyed, though, if I HAD, as it spent a good amount of time on this. As I said, for me, this was a positive. The story is definitely not one that lands in a single genre. It is part horror, part thriller, part paranormal... Also, I really like authors that are snarky and aren't afraid to have fun with their worlds. The tongue-in-cheek style was enjoyable for me. I enjoyed this book quite a lot and will look for more in the future because I found myself bummed it was over. I see that there is a 3rd book.I can't wait to read it!These books are so weird,but good if you have an imagination.Having talked to bathroom tiles as a kid,ours reminded me of elephants,I get it.I never expected tham to be murderers!This one tile has been killing for this girl for a few years now.Will it end?I hope not. Alexander Doddy was a good narrator.I was given this book by the narrator,author or publisher free for an honest review. I was voluntarily provided this free review copy audiobook by the author, narrator, or publisher and I applaud their efforts and generosity. How ever, while Alexander Doddy did an excellent job with his narration I just could not suspend my disbelief in this story. It is very well written and for me, would have been very entertaining if not for that willing suspension of disbelief thing. Joy Mutter is a good writer (IMHO) but this story was not for me. Maybe, I will try another of her efforts. So in a nutshell, not bad, just not for me. The narration was so bland that I never could get into the book. What didn’t you like about Alexander Doddy’s performance? I was very disappointed in this selection. I was gifted this book in exchange for an honest review. I could not get a feeling for the story or characters. In fairness to the author, I must chalk this up to trying to pick up the plot in the middle of the series. Why offer a free book in exchange for a review when it seemed to be based on the first book of the series. Let me say right up front that I enjoyed “Holiday for the Hostile; The Hostile Series, Book 2” even more than the original “The Hostile”. If you haven’t read/listened to “The Hostile” do that first so you will enjoy Book 2 even more. That being said, Book 2 does a fantastic job of standing on its own two legs with an introductory recap of the first book. But the storyline in Book 2, to me, was even more engaging than the first book. And Alexander Doddy does a great job managing both the various characters and the variety of accents. Well done. The quickest of reviews: I’m hooked. This is an unusual book made even more strange in this audio presentation. So much so, it is hard to quantify. Firstly, the main protagonist is a 14 year old girl and although written in the third person apart from a first person prologue is seen in large part from her point of view. It is inevitable filled with teenage angst, guilt and anger. And is juvenile. But there iare also some fairly violent, semi-graphic scenes of death and a lot of listing and sexual congress references, mixed with a fair amount of humour. It suggests a book to be lightheartedly enjoyed by adults looking for a fun story with a hint of paranormal horror, or older teens feeling grown up but naughty. However, the narration is such that it sounds like a book for older children, read in the sort of sing song reading, with wide ranging intonation and an eternal upbeat cadence reserved for telling silly stories of make-believe adventures. It certainly does not fit the content of this book. So for whom was it written? The idea of the story is really fun: a tile which is able to cause injury or death, but only at the request of it's human companion, in this case the girl, Serina. She is one of seven children, living pretty miserably together with her mother, both her father and step dad having been killed off by Tile X previously. Temporarily blinded by the evil tile, she tries to get on with a normal life but, afraid it might hurt her again, carries it with her even when the whole family (other than one sister) are taken to Ireland to stay with her grandfather. None of them want to go. Most characterisation is brief but enough to give a vague impression of the people, a sort of self obsessed teen's eye view of them. Almost all of them are unpleasant, human cartoons rather in the style of Rails Dahl. The author captures well the put upon attitude of a fourteen years old girl, especially one who also does feel at least a little responsible for the deaths of two parental figures but not enough to to see hurt of anyone else. It is funny and quirky, an entertaining light read for young adults and older adults alike. But not as a listen. The narration is often very good. Alexander Roddy's pleasant voice is well accented for the location of the story, namely Manchester, in England, and his vocalisations of the different characters is great, being distinctive and individual, well suited to each person speaking. But it is the reading of the between conversation text which is so perculiar. Very enthusiastic but with a wry twist, his intonations soar up and down without much relevance to what has been written and there are odd out of place pauses where none need to exist but none at all where they would be welcome, for example at the end of a chapter. At first, this just seemed to add quirkiness to the story. By half way through, it had become a maddening distraction. And, as previously mentioned, raised considerable doubt over who was expected to be hearing this book. 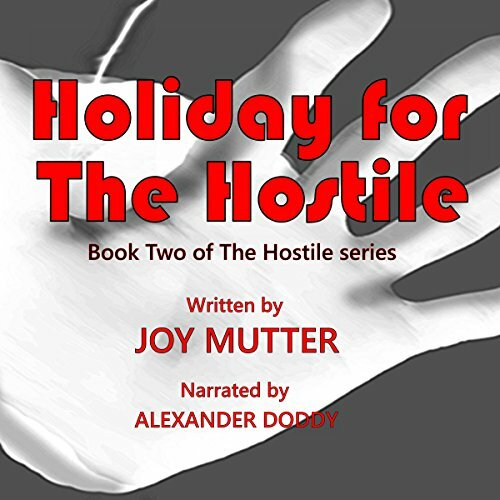 I was freely gifted my copy of Holiday for the Hostile, by the rights holder, via Audiobook Boom. My thanks for that: it was an experience. I cannot recommend it, however, as I really cannot see a suitable audience - the story is too old for the very young style of narration. Better to buy the print book. If you could sum up Holiday for the Hostile in three words, what would they be? Weird, Worrying and Wonderful. This novel is well off the wall, creates a great sense of unease but is great for all that. What was one of the most memorable moments of Holiday for the Hostile? What does Alexander Doddy bring to the story that you wouldn’t experience if you had only read the book?